A tidal disruption event (TDE) ensues when a star passes too close to a supermassive black hole (SMBH) in a galactic center, and is ripped apart by its tidal field. The gaseous debris produced in a TDE can power a bright electromagnetic flare as it is accreted by the SMBH; so far, several dozen TDE candidates have been observed. For SMBHs with masses above \(\sim 10^7 M_\odot \), the tidal disruption of solar-type stars occurs within ten gravitational radii of the SMBH, implying that general relativity (GR) is needed to describe gravity. Three promising signatures of GR in TDEs are: (1) a super-exponential cutoff in the volumetric TDE rate for SMBH masses above \(\sim 10^8 M_\odot \) due to direct capture of tidal debris by the event horizon, (2) delays in accretion disk formation (and a consequent alteration of the early-time light curve) caused by the effects of relativistic nodal precession on stream circularization, and (3) quasi-periodic modulation of X-ray emission due to global precession of misaligned accretion disks and the jets they launch. We review theoretical models and simulations of TDEs in Newtonian gravity, then describe how relativistic modifications give rise to these proposed observational signatures, as well as more speculative effects of GR. We conclude with a brief summary of TDE observations and the extent to which they show indications of these predicted relativistic signatures. 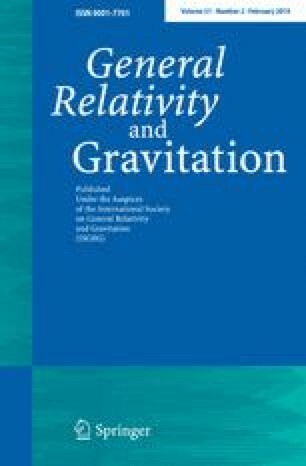 This article belongs to a Topical Collection: Testing the Kerr spacetime with gravitational-wave and electromagnetic observations. Financial support was provided to NCS by NASA through Einstein Postdoctoral Fellowship Award Number PF5-160145. MK is supported by the Alfred P. Sloan Foundation Grant FG-2015-65299, NSF Grant PHY-1607031, and NASA Grant 17-ATP17-0045. The work of RMC was funded by a Nicholas C. Metropolis Postdoctoral Fellowship under the auspices of the U.S. Dept. of Energy, and supported by its contract W-7405-ENG-36 to Los Alamos National Laboratory.